The decision was taken not to change the theme or the icons in Linux Mint 9 Isadora, making it look similar to the previously released Linux Mint 7 Gloria and Linux Mint 8 Helena. We looked into the making of a metallic looking theme, it was even mentioned publicly and I’m sorry to disappoint. Widgets had to use background pictures to achieve that effect and although it looked really nice on the desktop it was significantly impacting the performance of the system. We’ll still look into this and into ways of achieving this effect without making the system slower in the future, but it will not happen for Linux Mint 9. The window buttons in the title bar will remain on the right. The “Desktop settings” tool (mintdesktop) was rewritten and, among other new features, now allows you to set the layout of these buttons. I’m personally curious as to why people would place their buttons that close to the window menu, but who knows, maybe Ubuntu’s bold move in that direction can actually seduce people and start a new trend? So if it does convince you and you feel like placing your buttons on the left side, whether it’s Mac or Ubuntu style, the tool will help you do that. The default background for Linux Mint 9 wasn’t chosen yet. The Black leather background uses licensed artwork, so if it is chosen we’ll have to acquire the rights from its author (who doesn’t seem to be reachable at the moment). The designs at 99designs are incredible. Strange tho that the best ones there have been eliminated. #16 should be the default wallpaper, no doubt, end of discussion. I’m sorry to say this but it’s a disappointment for me…. Mint had always have the better look than ubuntu and this was the most important reason to choose mint over ubuntu. Now Ubuntu is changing and it looks really nice. Its look is much better than current look of mint. I was waiting for the right move that could allow to mint to look again better than ubuntu. Well I don’t know exactly what I will do with the next release. Maybe I will choose Mint, but I will change the theme to something similar to ubuntu themes… or maybe I will go back to ubuntu. It is not a good news for me because I am upgrading the ditro only every 2 years (I’am using only LTS versions) so I have to choose something that will be enough good looking for spending 2 years with it. The Black leather background is very nice. Also looking forward to the new release. Classic Mint style is very good, keep it up! Although I use “ClearlooksClassic” theme. I don’t like fanciful graphics. For me it’s good always to be able use something like Debian-style. I think Black Leather is a nice wallpaper, but maybe the AirMint things are a better choice? If they come in Gnome and KDE guise already, wouldn’t that provide a consistent first look? Personally I would like for the next wallpaper not to have a mint logo slapped on it. It’s one of the few things that has been bothering me about mint ever since I began to use it (Felicia), the fact that it has logos everywhere — and that’s just bad, one logo per screen ought to suffice (namely the one on mintMenu). I like all the wallpapers, really (except for the black leather one), only I wish the logos were removed. My vote is for #16 on 99designs.com, too. Although my great wish is the desktop picture to be taken directly from Nature. At this time of the year there is plenty of wonderful mint-green landmarks. Think about that. I prefer something real compared to artworks. Wallpapers? It doesn’t matter to me, since I never use but my own wallpapers. This being said, I can’t wait to install Mint 9. Keep on the good work. LA VERDAD… me gustaria algo ROBUSTO, con apariencia PROFESIONAL, nada de burbujitas y rayitas inocentes. I seldom use the default wallpaper for long. I’m more worried at how the user login screen is going to look, mint 8’s was terrible, and took “effort” to change. A part from that, mint is the best for me. Background from 99designs are very beautiful, I prefer #28,#24,#19 and #18. Else, Emotion and AirMint are not bad. I love the Black leather wallpaper. I don’t like the fact it’s not copyleft, though. Wow, this is amazing 😀 its nice too see that there is the option for the buttons! Totally agree on this one. Mint have been a distro that “just works” and very well. I like Linux Mint performance. I use to say it is a stable and fast Ubuntu. “The decision was taken not to change the theme or the icons in Linux Mint 9 Isadora…” YES! We were recording mintCast ep35 (http://www.mintcast.org/) last night, and totally by coincidence briefly discussing specifically this topic. I believe that for all LTS release, minimum changes should be made to the look’n’feel. People who stick to LTS (myself included), are basically people who like things to be stable and the same. I believe that Ubuntu has made a grave mistake in this area. That’s definitely bad news for me. I’ve been testing Ubuntu 10.04 beta since its release, and I was truly amazed. I was also wondering how was the Mint Team going to respond to this. Though I use Mint and Ubuntu regularly, I guess that I’ll switch to Ubuntu in my personal machine right now. For the looks, and for the ‘Light User’ approach. My machine for work purposes will still be Mint, I guess, since it has so many little useful features for advanced users, and I don’t really care for MeMenu, Ubuntu One or the shiny radiance and ambiance themes. In a perfect world, I would love to be able to port Mint features to Ubuntu and vice-versa, by installing some simple packages. Or, perhaps when Mint 9 is released, I will completely change my oppinion. Keep on pushing it guys, I love Mint. Marcos: You CAN import Ubuntu features and themes into Mint. All the packages are still there (I mean, we are using the Ubuntu repositories, right? ), so it’s just a matter of finding and installing them. Maybe a little configuration… 😉 I added Ubuntu’s user menu (the one on the right that’s labeled with your username and lets you set IM status, etc.) without anymore difficulty that installing a package. You can do the same from the Ubuntu side by just adding the Mint repositories, then installing the Mint-specific packages (from what I hear, anyway). Will Mint Linux 9 again have a custom login screen as do Mint 7, or will the Mint 8 status continue? As someone who is contemplating switching to Linux Mint from Ubuntu, I am glad to see that Clem actually tells the community his ideas and has even posted several candidates for the default background and has even added a feature to Mint that Ubuntu users suggested Canonical should do but did not. For the default background: I like Zwopper’s and the green AirMint but not the blue AirMint. At first, I didn’t like #28 by xcfdjSe7en, but when I looked at it some more, it grew on me. I also like #18 by AT YOUR SERVICE. Actually now that I’ve looked at them some more, I could live with any of them as the default. For me, Air Mint looks great. From 99designs, I like most #19 for its clear look. I feel both are a sort of evolution and in line with the previous editions. If someone prefers a more black wallpaper, I would suggest Black leather, which looks interesting or #29 from 99designs, again for the clear look. I really like the theme in LM7 and LM8, so I will definitely enjoy the look in LM9. I hope that whatever the future brings (LM 9, 10, 11…), this theme will not be completely removed, so that those who want it can still use it. The one big change I would like is increased boot speed..but after that if it ain’t bust don’t fix it! The personal choice of buttons capability is great, and the #25 paq_paq desktop background is fine, but I have no strong preference. I am just hoping that mscorefonts-installer (ie ubuntu-restricted-extras) and Brasero will work as well if not better than in Lucid, easing Windows interoperability and eliminating Helena/Karmic ‘coaster’ production. It’s true that Ubuntu is really pulling out the stops on the Lucid Lynx … I guess they’ve finally figured out that new users, the majority of whom are being pointed to Ubuntu (though more and more to Mint), want a stable, not-ugly release, not a redux to Windows 98 (in brown). Mint will have some stiff competition. Re: the button layout, I think while everyone posting in the blog knows what is meant by Traditional/Mac/Ubuntu layout means, it would be more clear to freshly minted users for it to indicate positioning, like: Traditional (right)/Mac (left)/ Ubuntu (left). Like a lot of other people, I like the black leather, Airmint looks good too. In 99 Designs I’m really surprised to see a lot of the earlier ones eliminated in favor of GIANT TACKY WORDART EXPLODING 9!!! style wallpapers. Seriously horror heart attack. Of the non-eliminated ones I think #30 (paq_paq) would look best in higher resolution, and is least like “I threw a bunch of cheap Photoshop/Gimp effects at your logo”, but #16 (xcfdjSe7en) is OK too. I love the idea to be able to set the window buttons in the top left corner of the window. I saw that Ubuntu was going in this direction and was hoping that Mint would follow. When I first changed my OS from Windows to Mac OSX I found that having the buttons on the left was so much more intuitive to work with than the MS Windows right sided buttons. I thank you for this change and those that are still skeptical, just give it a try. You will find that you adjust very quickly and wont want to change afterwards. I would have liked to see a metallic look on the theme, I am using flat black silent night II right now but yeah the air wallpapers are totally fantabulous, the leather although nice would work better with a chrome theme I’d like to see some more I candy on mint this is what mine looks like at the moment http://www.osgui.com/gallery.html?func=detail&id=1376 and with a dock http://www.osgui.com/gallery.html?func=detail&id=1375, but i’d like more nice themes that I didn’t have to put together myself necessarily, I mean I have no problem themeing it myself but some new cooler looks would be great. anyone know anything about this Plymouth boot I keep hearing about, I know that fedora uses it, but ive heard that lucid is supposed to have Plymouth on the new ubuntu, …. i ask because i would love to have that! Good move. I used Ubuntu 10.04 in alpha, beta 1 and beta 2 and was disappointed. It felt very alpha even with beta 2. All the way through they were changing this appearance or that. What did it for me was a kernel update that killed my system. Which is to say that all my computers have mint now. I will not update to 10.04 till Mint does. Current color theme is OK, but I feel it should need some new polish. I must say I’m somewhat disappointed that the metal theme project was abandoned. I really wanted the task bar to look less plain. I have been using LM since last year, still on LM6 cos I customise it so much. But I am looking to upgrade soon as LM 6 will no longer be supported. For me, I think that the most important thing about the os is the usability. Backgrounds are for users without imagination and flare. I change mine each week for a topical theme. This week the Iceland Volcano, next week who knows. The point being, spend more time and effort on the usability. Integration of other packages, e.g. Amarok, or Scribus etc is far more important than the out of the box background. And as for buttons and borders, there is a plethera of wannabe deseigners out there creating. The reason I am loath to upgrade each and every issue is that it is really a long job to re-install all my bells and whistles, only to find that they are no longer compatible with my way of working. So please, a little consistency along with improvement is best for us at the user interface end. 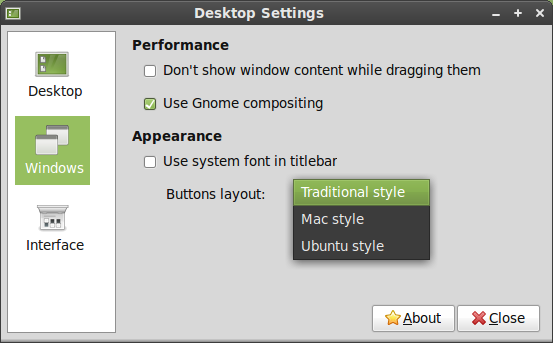 One problem: “Ubuntu Style” has now been officially changed to be an exact copy of Mac’s style. Might wanna remove that third option ;). It is like in the Real numbers set: between any two numbers one can find another one! For anyone new to linux is good to have a “good looking” theme, but after a while nobody stop anybody to change something. And there is a lot of stuff!!! Good decision. Mess around with the GUI with rolling releases not LTS, it should be tried and tested. Of all of these I like the darker green air mint background (without logo) best. Of the 99designs backgrounds my favourite one is #19. I like the 3D feel. It might be worth considering nature in the background too; a close up: green, leafy, wet, maybe :). I like the leather, it’s more like the older backgrounds, personally I don’t like dark themes and swirls/blobs don’t do it for me, for 7 and 8 I ended up going back to using the Felicia theme changing blue to green and find a nice picture for the desktop (currently a screenshot from Bladerunner), which is nice. I would say either #16 or #21. I mostly use my own background, but I still think it’s important what impression you get directly after fresh installation. And I think many users keep the pre-selected background. I also think #19 and #24 could be good candidates. Think in this way: If you look att TV, you can see computers in the background sometimes. You can directly see if they are running Windows (normally). But think IF they run LinuxMint – of course that should also be obvious directly without any doubt! Thats the way the default background should look like!! Glad to see that LM9 will not use the “light” theme. Actual Mint theme is far more clean for me. The Ubuntu “Leopard” (ooops, i mean “Light”) theme is not as cool as it seems (for me): Grey buttons are difficult to read, ugly rounded scroll and progress bars… All the theme is a ugly copy of the polished Leopard theme. Well, I’d say Emotion wallpaper looks great. It’s so… new! A bit dark, cosy, dynamic. My favourite. Airmint would be the second choice – looks a bit more plain than Emotion, although I like it too. Zwopper’s one has unusual color scheme… It just doesn’t look ‘minty’. Black leather – solid and serious, but it feels like I’ve seen it before. Perhaps in Felicia? Others at 99designs.com are nice, too, but every single one of the first four is better. I also vote for Zwopper’s background! And from outsourced ones I pick #16 or #25. Cool, I give mint a try to see the new themes. Thanks for the news. For me I like zuopper’s image the most, combining style, elegance, with a very nice color scheme, without departing too much from the traditional mint colors (lemon green, light green, dull green,dark green)…… why only green?. well… I will be installing this image in my next MINT if doesn’t come with it. I think that the theme should not be changed every release (maybe slight incremental changes). But it needs to be changed every second or third. I really hope that this means that mint 10 will have a nice new theme. I would also like to see more themes in the default selection in mint. That way a user can select from a couple of professional looking themes. As for the wall paper, I don’t really care, but something flashy looks good for new users. I would also like to say that I have been using the new version of mintinstall and although there a few features I consider missing (reinstalling, package properties, completely remove, etc), I have been really impressed! HUGE improvement on previous versions. I’m getting really bored with the look of Linux Mint. It used to be better than Ubuntu, but this will be the third release where it has fallen behind and not changed its look (shiki wise + gnome colors wise). I love the Mint Tools, but there isn’t a simple way to install them in Ubuntu. And changing the theme of Mint is more complicated than it sounds. There’s the icon theme, gtk, metacity theme and wallpaper that conflict when you try to install the Ubuntu ones. Then there’s the grub, login screen (totally different program), lock screen, and then some…none of which are easily changed. Linux Mint is a logo whore. I’ve never seen a distro with its logo in so many places. If you are going to keep the gnome-colors theme, you should merge the mono panel icons into it. After mono, I just cant go back to this. I am not the least bit disappointed in that the themes and icons will remain the same. I like Helena’s look quite a bit, and find it to be, by default, infinitely more elegant than the default theme of any other distro I’ve come across so far. At any rate, I like to try out different themes, so the theme originally issued with Mint isn’t ultimately of a lasting consequence. I use Mint primarily because of how well it works, and how friendly the community is. On the other hand, I am one of those weirdos that like their window controls on the left-hand side of the window. One would think that after 20 years of Windows, I’d be more comfortable with them being on the right, but having the control icons on the left just feels more intuitive somehow. I currently use a Mac4Lin theme on my Mint 8 to accomplish that. My point is this: I am really looking forward to Gnome 2.30, and other improvements that are made into the system to provide functionality; eye candy is secondary to me, and I am extremely relieved to hear that your team would refuse to adopt a different or prettier look at a noticeable performance hit. Can it run exe files and will it run 64bit Microsoft games? there is this game that it will not open Overlord. Even though I tend to customize my desktop out of the defaults first thing, I vote for AirMint. Very nice set of backgrounds. kiwisoup has a point. Changing Mint’s aspect should be easier. That’s why Mint 10 should integrate all design/theme aspects in a single administration tool. I would even go further and suggest that all desktop preferences should be available in the same administration tool. Resolution, refresh rate, effects, wallpapers and themes are all about what can be seen on the screen. If Mint is about simplicity, then simplifying administration should also be a part of the plan. For setting up the system, a one-time wizard could also present the users right after install/update various desktop settings and wallpapers to choose from, OR a tiny application that allows the user to access the most important look-and-feel configuration tools right after install. KDE did it and it was a very nice way to simplify the desktop customization before actually using it for the first time. My only issue with mint 8 is the login splash screen. It is very hard to customize anything besides its background. If customizing that screen becomes easier in mint 9, i will love it. I could care less that the metallic theme wasn’t implemented properly because i would be switching the theme on first boot. i like Mint because it works better, out of the box. i’ve installed ubuntu 10.4 beta 2 on my netbook, and it’s *very* good. mint 9 promises to be wonderful – and i don’t really care about buttons or wallpaper. i mean, c’mon; you can change that stuff. Very much looking forward to the release of Linux Mint 9, and thankyouthankyouTHANKYOU for making it easy to set the order of the titlebar buttons! My vote is for the Emotion background, the green version of course. It is very contemporary, and clean enough without being overly simplistic. Nice. Black leather – well done, but too reminiscent of older Mint backgrounds, which we have moved beyond, no? No “wow” factor. Zwopper’s background is also nicely done, but looks like something from circa 1999, and like it came out of Redmond. Perhaps that is a compliment, but I don’t think it suites Mint. AirMint – my second choice. Looks like a natural progression from Mint 8. Not a bad choice – simple, elegant. Glad to see 9 is progressing, can’t wait. The backup tool looks like it will be a great feature.The backgrounds, etc. are, of course, of relatively little interest to me. The OS needs to be easy to set up, easy to work with, and stable, all of which Mint always is. However, eye candy is an absolute necessity, especially in terms of competition and winning over new users. If it looks like crap out of the box, linux newbs are going to have one look, set the CD aside, and never boot it again. Most of us here can, and will, play with our own settings, but this is about an impressive appearance – first impressions. It MUST look as good as the competition, AND differentiate itself visually. The earlier black backgrounds were great for Mint, at the time, but are looking quite dated now. Great news that themes and icons are staying the same for Mint 9! I’m on my Mac all day for work, it’s such a nice break from OSX to use Mint. Not that OSX is bad, just really grey. (I like the Wildmint theme) Thanks for all your hard work, Mint people! #25 is my favorite, because it is not intense, but rather soothing. It has elegance. I prefer #43 from 99designs. Really nice with the green and black we have come to expect over the last two releases. Ooops. Meant 44. 43 I do NOT like! Several should be included. I particularly like 24, but without the 9, and with a more 3d logo. Thank you Clem for the lot of work you put into Mint. This cannot said often enough. what I wonder is why people do so much complaining and nagging about the background. That’s the first thing I change, to one picture out of my collection or the other. And when I have guests I use that pic with the raindrops on it, because for me it is the best background Mint ever had. Unfortunately, I need to use VPN’s and RDP to control numerous Win32 boxes. To date none of the Mint editions can do so adequately. They all rely on the same old packages that just don’t work. These are critical tools for me and it makes me unable to fully migrate to Mint – however much I love using the OS. If you want people (especially corporate people) to switch away from WinBlows, perhaps less time could be spent worrying about what background pictures to include, or the colors of the icons, or which music player will be installed. If that’s what is occupying your thoughts and time to generate a “new” version, may I humbly suggest you improve the components such as RDP and support for various VPN types so they work correctly and with good performance. I eagerly try each latest and greatest Mint, only to be disappointed again and again. Nice backgrounds, but the tools I need STILL don’t work. Perhaps it’s time to step back and reassess where the OS is going. stillinthecold: Attention to detail is important, and it doesn’t stop us from fixing other problems. Is not question that Linux Mint is the best OS and LM 9 looks very promising. About the look and feel on Gnome even I can customize to my taste it doesn’t give me the feeling as LM KDE does. In my opinion, keep it simple, if the icons could be changed for a better looking ones that would be a big improvement, the current ones looks very bland to me. To make adepts from Windows it will need to be more appealing to the eyes and I believe there is room for improvement. The bottom line for me is I’m using LM and love it, Linux Mint really rocks! I also like #44 best (from 99designs). Regarding logos and the like, it would be nice to include in the default installation three versions of the default wallpaper: with logo and version #, without logo, without logo or version number. The nice thing about removing the version number is it can be used in older or newer versions. I also agree with an earlier comment that too much use of logo doesn’t help the look of the desktop. Newbie questtion, will Isadora be related to the Ubuntu 10.04 release? or will this happen in mint 10? stillinthecold, your complaints about VPN and RDP are probably better addressed to the maintainers + developers of the relevant packages rather than guys who putting the distro together. I’ve had reasonable success with combinations of PPTP, OpenVPN with network-manager. Terminal Server client (tsclient) works reasonably well for my usage and if all that fails, running a Windows VM in virtual box usually takes care of it. It’s also interesting that the backgrounds seem to be the most hotly debated topic in the comments! Emotion – my favorite by far! Once installed, the best part of Mint is the Mint Menu and this is the reason that I will keep Mint (9) on my computers at work and at home. Simplicity and performance is important for me and everybody at home. Black Leather is No. !. But, personally, I don’t really care, I will switch to my background picture as soon as I install new Mint version. pick up the artwork and theme from Gloria and all is fine. I don’t care about the graphics as long as it doesn’t get in the way of the OS actually functioning efficiently. It is easy to change most of the “pretty stuff” if you wish so what comes as stock is not that important. However I am in agreement with a point that was made before. Its very cool that Clem is taking comments on the issue. I’m leaning towards entry #44 in the outsource contest. But, I’ve always prefered the themes that are black and darker greens. I have to say, nothing beats dew for looking elegant gorgeous and really fresh. zwopper’s wallpaper is really nice, love it. Am tempted to ask about how long do you all think Mint 9 will come out ? Concerning the leather background, that’s a no go! Seriously, dont even think about using the skin of a dead animal as a default background, people who wanna have it should customize. I’m not an armed vegetarian ;). Just saying, mint has this green “do no harm”-image, and it should keep it I guess. will it be able to run igh end games? Whatever the background is, stay with a green mint-like theme. That’s one of the things that set mint apart. The last two backgrounds were fantastic!!! I’m looking forward to the release of both Gnome and KDE editions. The usual stuff is, well, just too green. Looking forward to the upgrade. What’s the big deal with the background, just go and change it I’m using the one form Mint 7 as I like it better than Mint 8 and maybe better than what is default in LM9. I would rather see improvements in the way things work, for instance, if I run Ubuntu xsane works just fine as it does if I use debian, but with LM8 it is a pain to crop or darn near impossible. I have to do some more research on this but I think I have a problem adding music to myiPod Nano using Rythmbox but again I didn’t have the problem with Ubuntu or Debian. Could be the iPod not sure at this point. I’m not trying to knock this wonderful distribution as I like it and have use it on 2 of my machines and generally is what I install on someone elses PC when they want to rid themselves of Windoze. None of the distros are prefect. So in closing, Thanks to Clem and his crew for all their hard work on LM and I hope they keep it up. Thank you! my favorite is Airmint (should be something green) wasn’t it like that before ? Same with Sloshy. Ubuntu style is the same as Mac style now so there’s no point presenting two options for it, that will just confuse new users who might think they are any different. J’adore le fond d’écran Zwoopper’s ! Il est beau, a un air “souple” et moderne, tout à fait d’accord avec la “philosophie” de Mint. Je vote pour. J’aime les boutons placés à gauche dans Ubuntu 10.04 mais, à mon avis, c’est acceptable que le beau Mint continue à les employer par standard à droite. C’est important que Mint aïe une identité personnelle, indépendante d’Ubuntu. I prefer the default Mint 8 Helena wallpaper. Please make it an available choice. Glad you’re keeping the theme and icons. Helena is the ideal appearance for me and I would like that perfection to continue with Isadora. I am happy to see that you didn’t add extra decorations, unneeded bells and whistles, to what will become a long-term release. Reading your blog here gave me a sigh of relief. The improvements you bring to Ubuntu make it what it should be, but beyond that, don’t go overboard. 😉 So far, you are making the right decisions, and we thank you for that. I would like to mention something not related specifically to the theme but to the Welcome Screen. It would be good to beautify it a litlle bit, for instance, by placing a background image to the text and enhance it by providing a quick guide to common tasks, such as connecting to the Internet. Something that some people do not know how to do after installation (I discovered this by myself without guideance). I am suggesting this knowing that Linux Mint 9 is going to be released soon and I would like to see these things implemented. As for the theme issue, I found default destop theme too sober and simple, graphically speaking. I recently installed Windows 7 on my computer and the first impression is espectacular. The default desktop theme is elegant and shiny and very impressive. Fortunately, I managed to make my Mint 8 look like 7 because that is what I expect from Mint -a theme graphically amazing. I like to personalize my system. That is the main reason I am using Mint because I was able and learnt to customize it to my likings. Something that I was not able to do with Ubuntu. I am looking forward to installing Mint 9 and being able to enjoy its new improvements. As always, a big hug to all those involved in developing Mint!!!!! Sorry to disappoint, but the background from the forum are really ugly and old styled. Also, though I love how complete linux mint is out of the box, far superior than Ubuntu (that’s why I use Mint), the design is not inspired at all. Perfect distribution would be linux mint with the ubuntu theme available “out of the box”. Maybe with just linux mint logo in the menu bar, but ubuntu has better themes. Most commenters are usually fan-boys, and are all “wow great job” whatever is done but really the design is what’s lacking in Mint. PS: I surely will install Mint 9 but that’s what’s annoying with Mint, not visually inspired out of the box. How about using elementary artwork?, they are doing an awesome job (like sun did with nimbus, and i dunno why it isn’t anymore in the repos :S). They are the base of the humanity icons and the new themes. I don’t know, but breathe or elementary with some nice theme (murrina based maybe?) will improve the look. I like the feel of the leather background, you could go for a more corporate look with a darker theme to accentuate the mint icon and reinforce the security and reliability of your distribution. all things considered me personally i am not too much worried about the looks of an operating system as much that everything still works. i would be willing to sacrifice looks for additional hardware support. but mostly the single most important thing to me is that the OS remain stable and somewhat reliable. the current theme is fine by me its simple and pleasing the option to change and what is available are just fine at least for me. i switched to mint from ubuntu after seeing that much of the command line stuff is already done. yes i am a new linux user and have liked every bit of mint better than what micro(i do not speak the rest of that name) has to offer. if the machine has to run slower to be more appealing what is the point of that i dont really want to wait to blow windoze away i just want to blast them off the planet if it means i have an ugly front screen so be it..to the the mint team you guys are doing great work keep up the FANTASTIC JOB!!! It sounds great – The upcoming release of my favourate distro! Unloca ICT Solutions even provides support for NGO’s free of cost! Unloca ICT Solutions has provided NGO’s with Linux support for years. Unloca ICT Solutions designs website with Linux applications. Unloca ICT Solutions wishes to extend our thanks to the Mint team. Unloca ICT Solutions – heart of thanks to other users! #55, hands down wins from 99designs. Yeah it is definitely strange, there are some GREAT (my top favorites) designs on 99designs but they are ELIMINATED …!? Wonder why. I think its a good idea to not change to much to the next release. Mint already looks good. If you not like it you can easy change the wallpaper. Zwopper’s would be first choice & definitely no for me on leather. The leaders from the contest look great, but some are too “light” on the left which may render the labels under the icons unreadable (white on white). I agree with other commenters regarding LTS editions – staying more focused on stability and security. Backgrounds & look/feel can be changed if the user wants to experiment! Keep up a good work. All we are very curious how new release will look like, but most important how it will work. My vote goes to Emotion, green, logoless. I have a somewhat old laptop and it is very fickle when it comes to distros (trying to get Arch to work was a lession in futility), and Mint has been the old standby when I just want things to work. Lately, I have been using my wife’s windows 7 computer and I have been beta testing the Ubuntu 10.04 release, and now when I look at Mint it just looks SOOOO outdated. I honestly think it will be damn near impossible to switch a Windows user to Mint when they have their choice of Mac OSX (although luckily most of my friends won’t touch Mac because of philosophical reasons), Windows 7, and now Ubuntu. In the past it has been very easy to pass up Ubuntu because of the color scheme and general blandness of the distro. However, beta testing this distro I have been blown away! The polish the Ubuntu team put into this distro is truly remarkable. Everything feels like it just flows together. All I had to do was: Delete bottom panel, install dock, gnome-do, and done. It has never taken me so little time to be completely comfortable with the appearance of a distro. I was nervous and excited to see how Mint would respond, especially considering they said that they will be based off of Debian in the future instead of Ubuntu. I am so disappointed that it is still going to be Shatki colors and general blandness with logos everywhere. I think the only true competitor to Ubuntu in the future as far as apperance will go is the Elementary Project guys, but they have yet to even release a distro (and they better do it before Gnome 3 comes out). Ubuntu Swung for the fences on this one and I am not sure anyone else will be able to keep up. I just don’t think distro developers realize how important the out of the box appearance is for the average computer user. With Mac, Windows 7, iPad, Iphone, Android out there no one wants to feel like they are stuck in the year 2003. The start up time is also crazy fast on 10.04 and the buttons on the left grow on you. I didn’t realize how much I started to like them until they switched to the right side on one of the beta upgrades and for the first time I felt how unintuitive it is to have them on the that side, and I started looking for information on how to move them back on the final release. Anyway, I think it is imperative that Mint put some work into the theme or I think people are going to move back to Ubuntu. One other think I always change it to install Droid Sans fonts and decrease font size to 9 point. If you haven’t done this you have NO idea what you are missing, it take the professionalism to another level, and this is comming from someone who could usually give 2 *hits about fonts. The window buttons on the left are a matter of intuition since the right handed naturally place the hand on the left for every new action (as in writing newline). I personally like them better on the left. Hmmm… You know, I don’t care much about specific themes – metallic, brownish, bluish, whatever. If it works, it is all right. Don’t worry about it. But I did like Helena’s theme, and keeping it in Isadora is good, I think. “If it ain’t broke don’t fix it”. All in all, I think Mint is one of the best (if not *the* best) balanced distros around – technically and ergonomically. Basically, I just want to use this comment to say, once again, “Thanks, Mint” and “keep up the good work”. Being sure that blogging and posting is all about improving Mint, I wrote a report to try to understand myself and other Mint users. And I would like to add my opionion here, Clem, with all due respect. Since the philosophy behind Linux is freedom of choice, I feel that you should reconsider the name for your operating system. Mint sounds as if you were imposing the green color to your commnunity; not that you are doing this on purpose, of course. I’m sure there is an excellent reason for this name. I guess it would be good to think of a generic name. You know, I prefer dark+blue themes as they help me stand the brightness of the screen. So the mint concept does not apply to me. I am not suggesting to exclude the mint color scheme at all but to leave that on the hands of users themselves as one more option to personalize and not the color referring to your OS. I go further and say: if options 2 and 3 offer the same thing then there should be only two options -Traditional position (right) and Mac style (left). To be honest and fair, no need to mention Ubuntu here since it is Mac that has always been using this buttons layout. I would also like two more options concerning window settings. The possibility to place a background picture as content and also in window borders. And allow transparency as well. Clem, I strongly believe in your project because it gave the knowledge of Linux that I was looking for a couple of years ago. Now I can say what Linux is because of you. buttons in the top left corner = Da Poop. How about new Mint 9 splash screen? Thanks for making it easier to switch between buttons on the left and buttons on the right. I’ve been using Ubuntu for several years and after watching the Ubuntu “design” team attempt to drive it into the ground for a while now, trying out the Lucid beta for the last couple weeks has pushed me to find a different distro. This is what I love about Mint: You give the user a choice. Hm, i would like to see a Theme that looks like black brushed Aluminium. So a bit like Lian Li PC Cases or Silverstone ones. Would be much more modern. i think a crystally green theme looks perfect for mint,u not? Where do they announce these contests ..I always hear about them too late! and Im sure I suscribe to a bunch of mint sites. And with all due respect, I believe so far no wallpaper has come close to the concept and style of the default Mint 7 background image.. u know, the one with the water drops.. for me it has no match to this point. Why dun u guys stick to that one (for example) and just let the user download all of the rest through the software manager? Things must be really looking at change, I bought a cheap laptop for my Daughter and it has windows 7 on it, I couldnt be bothered loading on linux mint for her, so I just un installed norton, installed avg and firefox and office org and gave her it. Less than a week later she is begging me to install MINT, dad I hate this system, the sounds are funny, its too slow and I cant watch videos properly and the music is no good……What a girl, now I am going to have to spend some quality time installing MINT for her and wait for the appreciation afterI do. By the way she is 7 years old. If a suggestion could be made, I’d recommend to, at least, include the metal theme (and the wallpapers, of course) as available in the theme list, even if they aren’t put as default. Also, a transparent crystal desktop theme could be really nice for people that uses compiz and doesnt want to use KDE. I think I’ll try to do it as soon as I have mint 9 on my machine, and if the result is decent, to upload it for the community. I have no patient…….. when I will have isadora on my hands??? I’ve hated Ubuntu… When everyone was going crazy about every new release of Ubuntu, i was pretty happy with my OpenSuSE. While my friends’ system would suffer from bugs and crashes, my was rock solid. But there came a time when Novel made a deal with Microsoft, and that combined with some problems i experienced since SuSE 11, made me look for another distro who would suit my needs. I’ve looked into Fedora, but that’s like Ubuntu 2. Until that some day, while browsing through some forum, trying to solve a problem in my newly installed Fedora, i read a post of a guy talking about some linux called Mint… Weird, i though… According to his testimony, it was fast, good looking and worked right out of the box… I asked myself, how could such a relatively ‘unknown’ distro be that good. It was based on Ubuntu, he also said (something that put me off right away), but i kept reading… He said, ‘i don’t like Ubuntu’ but Mint has nothing to do with it… I thought i should at least visit the homepage. It had a good presentation, and the wallpapers where cool so i decided to give a try at the live cd. One boot, was all it took. My system was working with codecs, internet, EVERYTHING from a Live CD. And the aspect of the system was absolutely gorgeous. That’s what made me a fan of Mint. Since then, i’ve looked at Mint as the leading distro in looks, usability and ease of use. We can uninstall apps from the Mint Menu, we an indicator at all times of the state of our updates. Everything is nicely organized on just on Menu, and it’s even possible to set it to the Windows key. When i read that a new theme was coming, i though Mint was on the game again. It’s about time we have some transparency in Gnome, and Mint should be the one to brings us that leap. Already in Ubuntu 9.10 i installed it until Mint 8 came out. I go install mint because he have a backup tool. I am a noob.When a linux crash i cant do anything to repair. Thanks to all comunity and devs. We are discussing taste here! What looks good to one person will inevitably look hideous to another. What made me a big fan of Mint was not the wallpapers or looks, but its incredible stability and reliability. Thanks to the team for their exceptionally excellent work! I hope and pray that Mint 9 will function as well as Mint 8. Been a slacker for over 10 years(late bloomer…got my first computer at 34). The reason was simplicity and stability. I still use Slackware on my desktop but lately I’ve also been using Ubuntu, Zenwalk(Slackware fork) and, more recently, Mint on my netbooks and laptops. None of these have been chosen for eye candy. If the tools are available I can take care of that myself. I have one rule when it comes to setting up a new machine. Easy and fast deployment. Zenwalk, Ubuntu and Mint(as I’ve recently discovered) have it in spades. The one which works best on a given system gets the job.